Born in Aosta, northern Italy, in 1033 the son of a Lombard landowner, Anselm traveled to France in 1056 and entered the Monastery of Bec in Normandy in 1059. In 1060 he took vows and in 1063 succeeded the saintly Lanfranc, as prior and later as abbot of Bec, after Lanfranc became Archbishop of Canterbury. Following the death of Archbishop Lanfranc in 1089, the see was vacant for four years. Anselm was appointed Archbishop of Canterbury in 1093. Prevailed upon by King William II, William Rufus, to accept appointment as archbishop, Anselm was immediately pulled into the controversies and disputes that had disturbed the English church during the episcopacy of Lanfranc. The previous king, William the Conqueror, had sought the power to appoint bishops (lay investiture) and to control church revenues, a policy continued by his son. This conflict between crown and church caused Anselm to seek advice from Pope Urban II. In 1098 William II gave his permission for Anselm to travel to Italy, the first of two periods of exile. In Italy he defended the Latin position of the Double Procession of the Holy Spirit (“De Processione Sancti Spiritus”) at the Council of Bari. Upon the death of William II, King Henry I recalled Anselm to England, where he now refused to consecrate bishops appointed by the king. In 1103 he traveled again to Rome in an effort to negotiate a compromise on this matter between the king and the pope. Meeting with failure, Anselm remained in exile until 1107, when the papacy and the crown reached an agreement. Returning to England, Anselm lived two more years, dying in 1109. Despite the tensions and controversies that surrounded Anselm in his time as archbishop he was nevertheless able to focus on pastoral concerns during the few years that he actually spent in England, striving to reform and better train the clergy. 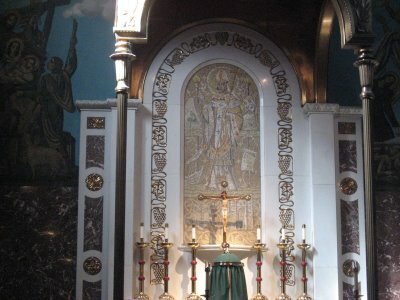 In addition to his struggles to uphold the rights of the church, Saint Anselm is remembered today for the body of writing, which he produced while at the Monastery of Bec and as Archbishop of Canterbury. Saint Anselm is considered the first of the Scholastics, a group of western theologians that was to culminate nearly two hundred years after him in the thought and writing of Saint Thomas Aquinas. In the “Prosologion” (1077-1078) he argued for the existence of God, postulating that God as the greatest good that can be conceived must certainly exist. “De Incarnatione Verbi” advances his teaching on the mystery of the incarnation. In his greatest work, “Cur Deus Homo” (“Why God Became Man”), he views Christ’s death in light of God’s mercy and love. Anselm was declared a “Doctor of the Church” by Pope Clement XI in 1720. Even today his writings hold interest for the breadth of intellect they display, for the theological thought expressed, and for the very real problems and personalities that he encountered in an event filled life. 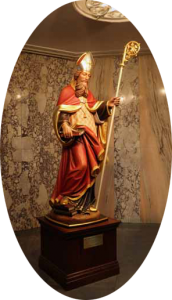 Saint Anselm’s feast day is April 21st.